This is one area of our lives we don't want to give up and besides it is a way for us to possibly earn a bit of money along the way and more importantly stay in contact with you all via the website. Concessions however have to be made as to what equipment can and can't come along for the trip. To make sure everything is kept up to date on our website, so we have the possibility to piggy back wifi points along the way, watch the occasional dvd and Son can do a bit of video editing as well, we have chosen to pack a Sony Vaio VGN T1XP/L laptop in the pannier bags. (Intel Pentium M, 1.1 GHz; 512 MB RAM ; 40 GB HD; Wireless/Bluetooth; 1.38 kg; 10.6" X-black screen; CD-RW / DVD±RW; 2x USB 2.0; 1x FireWire). + small; lightweight; reliable;can handle the bumps; works well with all programs; nice design. Due to one too many arguments over who could use the computer, we decided in Mexico to put a bit of peace back into our lives by purchasing a second laptop: The sapphire Blue Acer Aspire One with 1.6GHz Intel Atom N270 Processor; 6-cell battery; 160GB Hard Drive; 1GB RAM; Integrated 802.11b/g Wi-Fi Certified and Acer Crystal Eye webcam. We bought the Lenovo on our return to the Netherlands in summer 2010 and after the Sony Vaio stopped working indefinetely. The Ideapad S10e is the only netbook with an extra slot for an express card. And that is very handy if you want to load your films from your camcorder into your netbook: that requires a Firewire connection and no netbook comes with a Firewire connection... so we bought an express card with two Firewire ports and now we can load our films! So far, the Ideapad has performed very well, although lately makes a lot more fan noise than it did before. Unfortunately that seems to be a common Ideapad problem... you can't have it all. Well, it wasn't. When in Ecuador (September 2009), we purchased another HDD, this time a 500GB WD Passport. The size of the drives is getting bigger (in GB that is), while the price stays about the same (around US$ 100). All our travel drives are great. We have not had problems with any of them and as time goes on the storage space is doubling while the price remains the same. That's excellent news for people like us. The Sony Hi-MD MZ-NH900 Minidisc Walkman would have to be the biggest disappointment of all our equipment. Our first piece of advice: don't buy one for saving your music files on, because if you don't have the same computer that you originally copied all your cd's to, then you can never play your music again except for on the Sony Minidisc. So imagine our dismay, when we lost a couple of our minidiscs: our music was gone. Even music I had received from a band on one of their home-made cd's. Lost lost lost forever! Further to the Sony minidisc headache, the batteries are rubbish and last about an hour on play time before they need recharging. And you can forget recording without the very short electrical cord attached. Even if you get this far, when you record serene background noise, you can hear the Sony walkman grinding away in the background. Mmmm... so much for ambience. And last, but not least, the display window scratches so badly that after a while you can't read what the LED is displaying and you'll end up deleting something. All in all a useless piece of junk for a big big price tag! - display window scratches beyond repair; batteries chew through the power; needs constant recharging; can't record without electrical input; makes grinding noise while recording; very expensive; have to buy discs to save data; can't retrieve your music for any other player or computer unless you have the original computer where you transferred your music from. Thanks to a dear friend, we were the lucky recipients of a brand new iPod shuffle measuring 1.07 x 1.62 x 0.41 inches (H x W x D) and weighing 0.55 ounces. What a super little gadget this is, wearable straight out of the box this mini machine lets you listen to up to 240 of your favourite songs. It clips onto anything and is now available in lots of colours, so you can own more than one. Very clever! The same dear friend gave us his old Apple iPod classic 30 GB that measured 7 x 5 x 3 inches, weighed 1 pound and was not working. This iPod had taken a bath in the ocean and was no longer functioning, but Ali managed to find some life in it and purchased a new battery kit for $US30. It appeared to be on the road to recovery, but not long after, it crashed. While it works now it does have its moments when it gets stuck and it does need a lot of recharging. But hey it was for free. We bought this camera before we left and tried it out quite successfully. 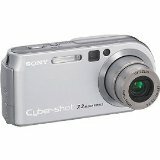 The Sony Cyber-shot takes beautiful pictures, clear and detailed with great colour contrast and brightness. The flash option is not quite as good, but it is okay for such a little camera. What we didn't know before we left, was how this camera was going to perform on the road. Well, it didn't. Not even 3 months into the trip and we had dust bunnies the size of eggs on our photos. The long battle with these digital blobs began and so did our continual search for a Sony Service Centre. We have visited five all together in Spain, Turkey, Pakistan, Thailand and Korea. It ends up being such a pain in the neck trying to find these places and cost us way too much money each time. We also have to fight to get them to clean it for us. The immediate solution is that we need a new lens. Sure, so it can happen all over again!. We have spent enough money so far, that we could have bought the camera all over again. The simple fact of the matter is: the lens is prone to letting in dust and you can't do anything about it. Sony doesn't want to know about it either and according to them its our fault. It all got too much in the end and our photos were ruined, especially if they had a blue sky in them. We ended up purchasing another camera in Tehran and only currently use the Cybershot for quick snaps only. We would never buy another one for such constant use. + small and compact; takes high quality digital photos by day; good brightness and contrast; has mpeg film capability; mono sound is pretty good on the film. - flash is limited to a few metres range; lens is prone to dust bunnies; lens sticks; buttons end up sloppy and not responsive after 1.5 years use; expensive when you consider how much use you get out of it; poor customer service in Europe. We bought the Canon SLR in Tehran, Iran, as we wanted better photos and performance than what our Sony Cybershot was giving us. We later purchased a Sigma 80-200 digital lens in Kashgar, China. In the meantime we've bought a Terrax multi-card reader in Loja, Ecuador. You can get the photos off the Canon via the USB cable, but this takes a long time (the Canon is too slow) and it freezes the computer every now and again. 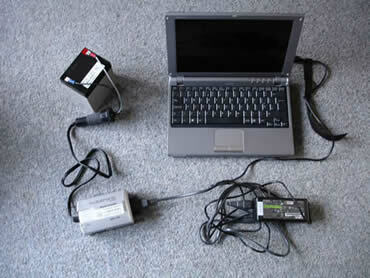 When we tried downloading the photos via a card reader, it was at least five times faster. So we bought this US$12 gadget (4x2cm, 25 grams) to come along with us. Canon was not our first choice, but Iran seems to only stock Canon cameras so we didn't have many options. We are not at all disappointed. It is a decent basic digital SLR camera and takes good shots. Only down points are there is no film taking capability as with a compact camera; you can't see the picture preview on the screen, only via the view finder; and the kit lens is not adequate. Also, in the world of digital technology, it appears that there's no getting away from dust bunnies (dust on the sensor). We needed to get the lens cleaned in Korea, though it was a lot simpler than our Sony Cyber Shot cleaning quests. We found a Canon Camera Shop in Korea, walked inside and they did it in an hour, the same day. We are generally very happy with the Canon EOS350D. We had the camera cleaned again in Cali, Colombia, for the same reason. So we could take video along the way, Son purchased a Sony digital handycam with high precision Carl Zeiss Lens, 1.55 million pixels single CCD and large 3,5" colour LCD screen. An ECM-MSD1 microphone will be used with the handycam. She chose the DCR_TRV30E model at the time due to it having the following specifications: IEEE 1394 - FireWire/i.LINK; DC power input; S-Video input/output; headphones and microphone input; and composite video/audio (input/output). This is now a very old camera and is quite bulky in comparison with what is on the market today, but it is a total workhorse and it is still going strong. I love the real buttons and the solid feel about it. It feels more like a camera than a handycam. Not everything works as smoothly as it first did: zoom sticks on some days; manual focus has a mind of it's own on others; and the microphone input is nearly threaded which causes bad connections. But in the same breath, this camera has been through the wars: all sorts of weather conditions, bumping around in my handlebar bag, on the most atrocious dirt roads, over major potholes in dusty conditions while it is attached to the tripod on my bike. And yet, it keeps on giving a beautiful image. That bit you cannot complain about. The camera in general is really easy to use and I love the way you can manually install white balance and also have control over the brightness and contrast while filming as well. The lens casing fell off at one stage and can't be repaired. We super-glued it back together and it has stayed on ever since. That was 25 months and many mini dv tapes ago. + real buttons; solid feel; easy to use; large LCD screen; batteries live a long time; excellent picture quality; able to add external microphone; sturdy, solid and reliable. Our reasoning behind buying so many Sony products was for compatibility. Some of the equipment has performed well and some not so well. In the latter cases we have had to contact Sony and visit numerous registered Sony Service Centres along the way. One criticism that we hear time and time again and do agree with is that Sony Customer service is crap. This is certainly true in the western world. They just don't give a '#$%!' about the little man once you have bought a product from them. Furthermore, while they have such a high profile name their affiliate shops throughout Europe leave a lot to be desired as far as professionalism is concerned. That said, we found that Sony Customer Service in 'modern' Asian countries to be completely different. In South Korea (Busan and Seoul) it was impeccable, even though there was a huge language barrier. Still, we are not at all happy with their neglect of our situation and uncooperative manner when we had problems in Europe. We will think twice about buying any of their products again for this factor alone. There are many other brands and models of electronic equipment that are cheaper, perform just as well and you might even get a bit of service when you need it. We figure this combination of solar equipment should give us enough energy to re-load our batteries in remote areas and make us more independent while back country camping. If you are looking for something similar, our suggestion is to get in touch with iSys Solar in Adegem, in Belgium. They will personally help you choose the right gear for your self sufficient tour. We and our electronic equipment spent a whole afternoon with them discussing our requirements. We don't hesitate to recommend them for their customer service and knowledge of this unique area of portable solar energy. We've included a small voltage meter in the luggage as well to check the battery while enroute. You'll probably be thinking, what are they gonna do with all this stuff. Isn't a photo camera enough? Well, we'll be hoping to work a bit for ourselves along the way and Sonya, being addicted to video editing and doodling in photoshop, will be using the abovementioned gear to make some moving pictures as well. Below is the set-up we used for about two years; before we shipped everything to Australia... The reason? Check underneath the pictures to find out exactly why... We connect the sigaret lighter plug to the battery... then plug the solar panel into the sigaret lighter plug. This should load our battery. When it's full (or when we need the power) we disconnect the battery from the solar panel and connect the inverter to the battery. The inverter converts the power from 12V to 230V and we can plug any electrical component in the inverter. So we can now work on the laptop or just load the laptop's battery. And if we want to know if there's still something left in the lead-acid battery, we connect the voltage meter to see what the voltage is. With the table underneath we'll be able to see if the battery has enough life in it to load even more of our stuff. Why oh why would you not want to be self sufficient? Secondly, carrying a battery on the plane, when you are already over the baggage limit only adds dollars to your fare. And at $US20/kilo for excess luggage, a battery can cost more than it is worth. But you never know what your chances are of finding a similar product in the rest of the world. And again what is the price and the weight of the energy box. We replaced our first battery in Japan, but could only find something double the size. So Ali carted the 3 kilos around in gloomy rainy weather for a few weeks until we figured it was best to get rid of the thing. A local junk yard was happy to take the battery off our hands. While experts will say that the system works even when the sun isn't shining , our experiences say that that's a lot of hogwash. It doesn't, or at least it's efficiency is almost nil. We sent all the gear to Australia from Korea. Maybe we'll have more luck with it there. It was not a failure as such, the solar energy system for travelling cyclists just has its limitations. We are now dependent on power sockets in camp sites, hotels and outside supermarkets. But since we have a lot of extra batteries to power our electrical equipment, this should work out fine. We have recently bought two led headlamps with rechargeable aaa-batteries and a re-charger, of course!